VietJet Air is planning more ambitious expansion for 2014, including several new domestic and international destinations, as it looks to leverage its position as the largest low-cost carrier in Vietnam. The privately-owned group also aims to launch at least two overseas joint ventures in 2014. VietJet, which turns two years old on 25-Dec-2013, already accounts for about 25% of Vietnam’s domestic market. It aims to capture a 45% to 50% share of the domestic market by the end of 2015 as it grows its domestic network to an expected 20 destinations, up from 11 currently. In the international market VietJet only currently serves Bangkok. But the carrier aims to launch services to Cambodia, Hong Kong, Indonesia, Korea, Japan, Singapore and Taiwan by the end of 2014. VietJet is still a relatively small carrier, operating 10 A320s on 14 domestic and two international routes. But VietJet has quickly become a major player in Vietnam, where less than one year after launching it was able to overtake Jetstar Pacific as the second largest carrier, and has huge ambitions. The group’s intentions to become a major player in the large but increasingly competitive Asian LCC sector became clear in Sep-2013, when VietJet signed a memorandum of understanding with Airbus for 62 A320s along with 30 purchase rights. See related report: VietJet places major A320 order. Is there room for another pan-Asia low-cost airline group? VietJet board member Chu Viet Cuong told CAPA on the sidelines of the 27-Nov-2013 CAPA World Aviation Summit in Amsterdam that the group plans to complete the deal with Airbus by the end of Dec-2013, which should allow Airbus to include it in its 2013 order tally. Mr Chu adds that VietJet also has agreed to lease eight additional A320s, lifting its total commitment to 100 aircraft (includes the 30 purchase rights). CAPA previously reported that the deal includes 20 current-generation A320s/A321s, the first two of which will be delivered in 4Q2014, and 42 new-generation A320neos. VietJet currently leases its entire fleet and plans to lease another A320s in 2014 before the aircraft that are coming directly from Airbus start to kick in late in the year. “We will try to increase our aircraft fleet from 10 currently to 20 for the next year,” Mr Chu says. He adds that VietJet’s target is to carry between 5 and 6 million passengers in 2014. Since its 25-Dec-2011 launch the carrier has transported just over 4 million passengers. VietJet still sees room for further domestic expansion although the carrier already operates on the 13 largest domestic routes in Vietnam. VietJet launched services on 9-Nov-2013 to Qui Nhon, giving it 11 domestic destinations. VietJet currently operates 37 daily domestic flights on 14 routes. 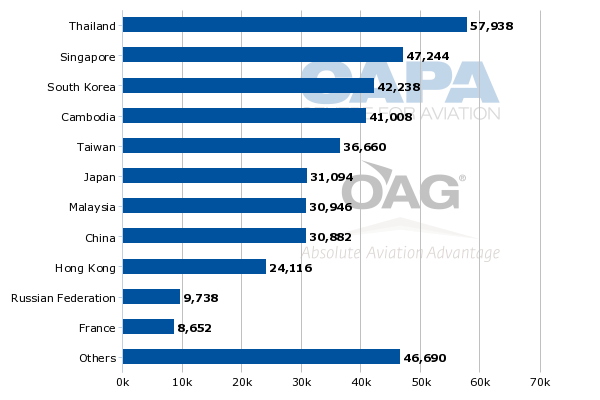 Its 93,240 weekly domestic seats equates to about a 25% share of total capacity in the Vietnamese domestic market, according to CAPA and OAG data. VietJet has an opportunity to further grow its domestic market share in 2014 by adding frequencies on trunk routes, launching services to smaller domestic destinations and opening new point-to-point routes. Most domestic routes in Vietnam are from either Ho Chi Minh or Hanoi, the country’s two main cities and the two bases for VietJet. But as the Vietnamese economy continues to grow and the country’s middle class population in secondary cities expands, demand to connect other destinations is starting to emerge. VietJet’s low fares can potentially stimulate demand to the point where new point-to-point services can be sustained. A large portion of VietJet’s passengers to date have been first time flyers. Given the country’s geography (Vietnam is long and narrow) and relatively poor rail and road infrastructure, there are huge opportunities for LCCs to transport passengers that previously travelled on Vietnam’s notoriously slow trains or buses. VietJet also has an opportunity to launch more new destinations in Vietnam as it still has a much smaller domestic network than Vietnam Airlines, which currently serves 21 domestic destinations, according to OAG data. Several of the domestic destinations not already served by VietJet are secondary markets that only currently have turboprop services from Vietnam Airlines or its regional unit VASCO. But VietJet believes there is sufficient demand in these smaller markets to support 180-seat A320s with stimulation. Again, economic growth and the emergence of a middle class in the smaller cities are key drivers in opening up opportunities in such markets as a combination of lower fares and higher discretionary incomes can significantly change the dynamics of route economics. Such a large share is conceivable given that the Vietnamese market is essentially a duopoly. Following the Feb-2013 collapse of privately owned regional carrier Air Mekong, Vietnam currently has only three carriers – VietJet, Vietnam Airlines and Jetstar Pacific. 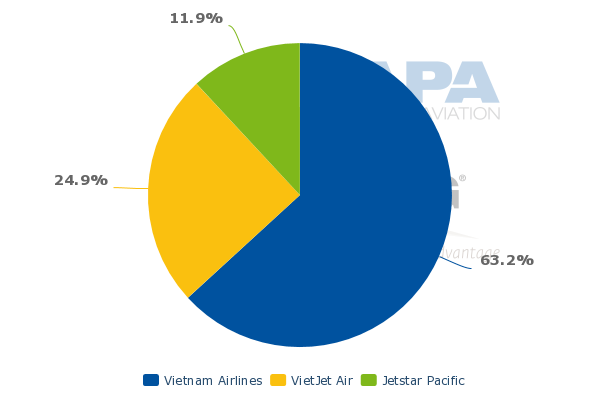 But Vietnam owns a majority 70% stake in Jetstar Pacific, which has not pursued any expansion in recent years and recorded a 3% drop in RPKs for the fiscal year ending 30-Jun-2013. Jetstar Pacific has repeatedly delayed plans to expand its network and fleet. It currently only serves seven domestic destinations and eight routes with a fleet of five A320s. One more destination and two more routes are being added on 15-Dec-2013. Securing a 45% to 50% share of the domestic market, however, will not be as easy as VietJet’s quick ascent to a 25% share. The next phase of rapid expansion by VietJet could finally prompt a response from Vietnam Airlines, which could potentially accelerate domestic growth at the Vietnam Airlines brand and start pursuing growth at Jetstar Pacific. A more aggressive strategy from Vietnam Airlines for targeting the budget end of the Vietnamese market is inevitable, particularly as the government-owned flag carrier prepares for an initial public offering. Potential investors will be keen to know how the Vietnam Airlines Group plans to progress with its two brand strategy, which remains relatively undeveloped, as VietJet continues to expand. In addition to entering smaller domestic markets, VietJet will also need to expand frequencies on trunk routes if it is to succeed at capturing a 45% to 50% share of the market. On the main routes of Ho Chi Minh-Hanoi, Ho Chi Minh-Da Nang and Hanoi-Da Nang, Vietnam Airlines currently has several more frequencies than VietJet. These three routes connecting Vietnam’s main cities are by far the largest in Vietnam, accounting for almost half of total domestic capacity in the country. VietJet will likely continue to gradually add capacity on trunk routes, risking a competitive response from the Vietnam Airlines Group. While the Vietnamese domestic market has the potential for rapid growth on both the main and secondary routes, over-capacity could result if all three of the country’s carriers pursue rapid expansion. Discretionary income levels in Vietnam are inching up but remain low with average GDP per capita of less than USD1,500. Air fares may have to be reduced to very low levels for the likely surge of additional capacity to be absorbed, leading to unsustainably low yields. VietJet is confident the LCC model is the right model for Vietnam and the carrier can continue to attract new customers by offering a low fare while providing a “friendly, fun and on-time” service. But from an economic and market development perspective, Vietnam may not be ready quite yet for the domestic growth envisioned by VietJet. VietJet, however, is not entirely betting on the domestic market as it is also seeking ambitious international growth in Vietnam and through new joint ventures in other Asian markets. VietJet’s international network currently consists of only one international destination, Bangkok Suvarnabhumi, which is served from both Ho Chi Minh and Hanoi. Mr Chu told CAPA that over the next year the carrier plans to launch services to Seoul Incheon in South Korea, Taipei in Taiwan, Siem Reap in Cambodia, Bali and Jakarta in Indonesia, Hong Kong and Singapore. Service to unspecified airports in Japan is also envisioned. VietJet has not yet set a launch date for any of the planned international destinations. Seoul is expected to be launched first. VietJet has been preparing for several months to begin serving the Hanoi-Seoul route by the end of 2013 although it now appears the service will likely not commence until 2014. VietJet executives have also repeatedly expressed interest in serving China, Hong Kong, Singapore, South Korea and Taiwan. Singapore and Taipei were originally in the carrier’s business plan for 2013. Singapore, Taiwan, Japan, China, South Korea and Hong Kong are all among the top 10 international destinations from Vietnam based on current seat capacity levels. LCCs are now only serving one of these five markets, Vietnam-Singapore. 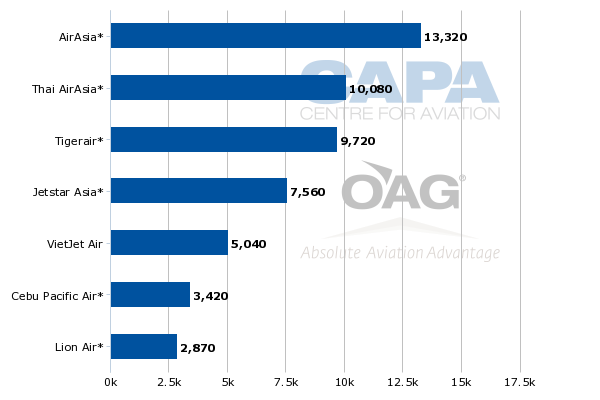 LCCs currently only account for about 13% of international capacity in Vietnam, with all of the capacity coming from LCCs based in other Southeast Asian countries. 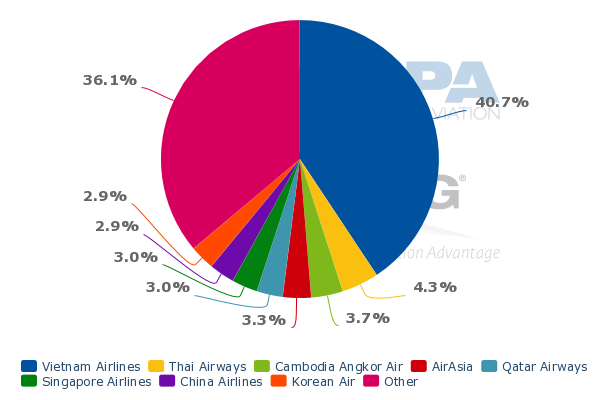 Vietnam Airlines has a leading 40% share of international capacity in Vietnam while VietJet currently has only a 1% share. Jetstar Pacific does not currently serve the international market although plans to commence international services in 2014. While Vietnam’s international market is growing rapidly, the growth has so far been mainly inbound. VietJet believes the outbound international market will start to grow more rapidly as discretionary income levels increase. The carrier will be well positioned to tap into any growth in outbound international demand as it can leverage its strong domestic brand and low cost structure. But VietJet will not be able to rely on outbound traffic for most of its planned international routes and will need to build its brand overseas to successfully penetrate the international market. VietJet currently lacks a strong brand outside its home market. The group has ambitions to establish a regional brand in Asia, which will be developed as it launches international routes from Vietnam and establishes affiliates in other Asian countries. But with the Southeast Asian market already successfully penetrated by four much stronger LCC brands – AirAsia, Jetstar, Lion and Tigerair – VietJet will have an uphill battle as it seeks to establish itself as a major regional player. VietJet has fallen behind in launching its first overseas affiliate, Thai VietJet. The group announced in late Jun-2013 plans to establish an LCC joint venture in Thailand with tiny little known Thai regional carrier Kan Air. Thai VietJet is still working on securing its air operators’ certificate (AOC) and has not provided over the last five months any update on its launch plans or provided a launch date, initial route network or strategy. Mr Chu says VietJet and Kan continue to negotiate a joint venture agreement and declined to provide a timeline for the AOC process as it is in a “sensitive” stage. Meanwhile, Thai Lion has beaten Thai VietJet in becoming Thailand’s third LCC. Thai Lion commenced operations on 4-Dec-2013 and is currently operating from Bangkok Don Mueang to Chiang Mai. If and when Thai VietJet enters the Thailand market, it will have to overcome competition from Thai Lion as well as Thai AirAsia and Thai Airways LCC affiliate Nok Air. The market may not be able to support four local short-haul LCCs over the medium to long term. VietJet also has been negotiating a potential joint venture agreement in Myanmar with Golden Myanmar Airlines, an LCC which launched services in early 2013. “Our target is to sign an agreement with them next year,” Mr Chu tells CAPA. Golden Myanmar has been struggling, with initial load factors below 50%, and could use a capital injection. VietJet sees an opportunity in Myanmar as the market is growing rapidly and has only one local LCC, Golden Myanmar. But the Myanmar market has its challenges, including over-capacity on most routes. Mr Chu says VietJet also is discussing a possible joint venture with a South Korean LCC and is exploring opportunities in Taiwan. “We are looking for local partner to set up [in Taiwan]. Taiwan is one of biggest foreign investors in Vietnam. We have very close relationship with Taiwan,” he explains. VietJet has quickly become a significant, profitable and successful player in the local Vietnam market. But replicating that success in other markets will undoubtedly be more difficult given the fierce and intensifying competition in Asia’s budget airline sector. The group will have to overcome several challenges in 2014 and beyond as it starts to grow its international network beyond the current one destination and compete with Asia’s more established LCC groups. VietJet’s least risky opportunities are in Vietnam’s domestic market but that market will only be able to support a relatively small fraction of the 100 additional aircraft the group is committed to acquiring. 2014 will be an important test for VietJet as the group pursues rapid expansion and starts to compete more with other LCC groups in what has become a crowded marketplace.